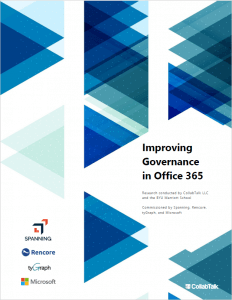 We’re delighted to announce the publication of the “Improving Governance in Office 365” Report. The report is based on research conducted by CollabTalk and the Marriott School of Management at Brigham Young University in collaboration with Rencore, Microsoft, tyGraph and Spanning. The findings of the report shed light on governance practices within organizations at a time when moving from on-premises to the cloud is increasingly common. By looking into the day-to-day practices, pain points can be identified, and decisions can be made on additional tooling to support governance efforts, aligning with Microsoft’s latest product and support focus. This research benefits administrators, platform owners, CISOs, CEOs, COOs and IT executive management. Are organizations evolving or changing their governance activities as they move to the cloud? Due to evolving technology, processes and roles, are organizations aware and keeping track of the change in governance as they moved to the cloud? Compared to the past three or five years, how is governance perceived and managed today? Were third-party tools used as much to govern activities when organizations were purely on-premises compared to hybrid or cloud-based environments? For this study, customer, partner and Microsoft MVP interviews were conducted. Secondary academic and industry research, as well as content from global Office 365 customers was used to answer key questions on governance awareness and readiness. Click the button below to download a free copy of this comprehensive Office 365 governance report today!